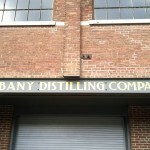 Last Friday I had the opportunity to attend the Grand Opening of Albany Distilling Company, and it was a great time! Albany Distilling Company is the result of a two year long legal & financial process and the determination of two friends John Curtin and Matthew Jager who together had a vision of opening the first licensed distillery in the City of Albany since prohibition. 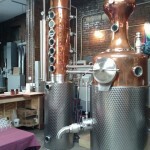 Much of their vision became possible with the passing of the farm distillery license law, enacted in 2007. And just this month Gov. Andrew Cuomo signed legislation permitting licensed farm distilleries to sell liquor at fairs and markets and at the New York State Fair which will no doubt be a major benefit for Albany Distilling Company to get there product into the hands of the consumers in Albany. Rehabbing an old building in Quackenbush Square, that is connected to the Pump Station and used to be its “coal yard”, Matt and John have transformed the structure into an absolutely beautiful distillery space. Their 600 liter (158.5 gal) hybrid pot and column still is an amazing work of art. If you get a chance you should definitely stop by the distillery and have a look (and perhaps a taste) the building and still set-up are worth it. The first product that ADC has available is their “Coal Yard New Make Whiskey” and this is one of the best white whiskies that I have tasted. It is surprisingly smooth for being an un-aged product. John told me that he and Matt only had to go to their third batch before coming up with the mash bill that they felt was right. The two have some of the same spirit currently sitting barrels that if all goes as planned will be available as “Ironweed Aged Whiskey” possibly by December. ADC has plans for a Rye, a Rum, and a Vodka in their future – all of which I am seriously excited about. The Albany Distilling Company’s grand opening was an awesome event and I have no doubt that Matt and John are well on their way to being very successful – I wish them all the best and plan on visiting them many (maybe too many) times.